Bruce Langford works full-time in the field of mindfulness as a consultant and life coach. He is the host and creator of the Mindfulness Mode Podcast where he interviews people from all walks of life who use mindfulness to stay centered and grounded. At one time, Bruce lived with a high level of anxiety, but as he began to apply mindfulness strategies, his anxiety became minimal. Skip ahead several years and Bruce now teaches many of these same strategies. Bruce’s background in the field of bullying prevention gives him a unique perspective because of the connection between self-sabotage, bullying, and mindfulness. He has delivered more than 1,700 presentations and trainings, and his writings have appeared in numerous publications. 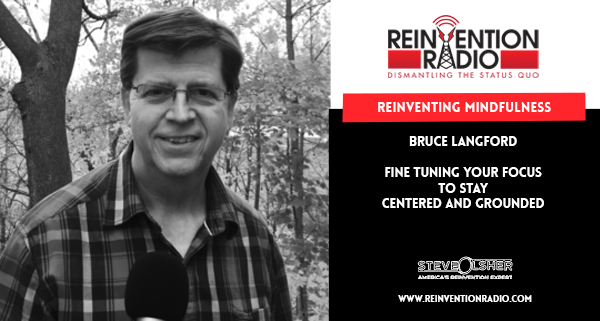 TUNE IN to this episode as Bruce chats with Steve, Mary and Richard about fine tuning your focus to stay centered and grounded. 3 – Do we choose to be happy? ; Feeling contentment to find joy; Stress and anxiety changes your brain; What’s keeping Bruce up at night? Reinventing New Media Summit – In this episode, Reinvention Radio Crew shares their individual experiences and thoughts on the event.